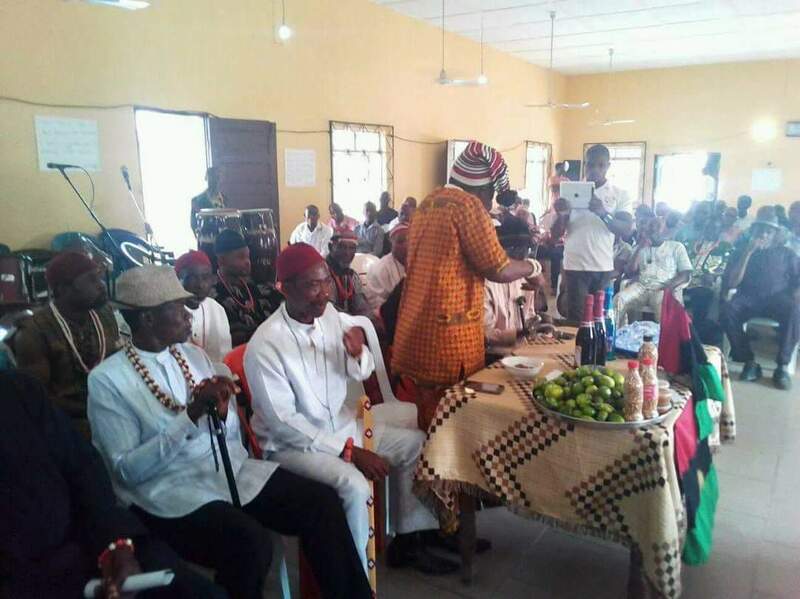 The Indigenous People Of Biafra (IPOB) under the supreme leadership of Mazi Nnamdi Kanu, officially inaugurated IPOB Akwa Ibom state chapter and elders forum on Friday 12th January, 2018, which took place in Uyo the capital city of Akwa Ibom state. The inauguration witnessed the presence of the regional coordinators of Ebonyi state, Enugwu, Abia, Imo, Akwa Ibom and River states (Igweocha). Mazi Akpan, the national IPOB leader elders forum, Ebonyi state IPOB coordinator Mazi Igwe Ogbonnaya and many other national officers from the region and beyond were also present to witness the official inauguration of IPOB Akwa Ibom state chapter to the glory of Chukwu Okike Abiama. Biafrans in Akwa Ibom state, who thronged the inauguration arena could not hide their feeling as they were thrown into wild jubilation that the state is now fully involved in the struggle to restore Biafra under the able leadership of Nnamdi Kanu and IPOB. The three senatorial district in the state were fully represented, Mazi Earnest Robinson Ben, Eket Senatorial district representative, Mazi Samuel Bassy, Uyo Senatorial district representative and Col. Sunday Iyang, Ikotekpene Senatorial district representative. They unanimously pledged their unalloyed support to the state coordinator and the supreme leader of IPOB, Mazi Nnamdi Kanu in the struggle for Biafra restoration. 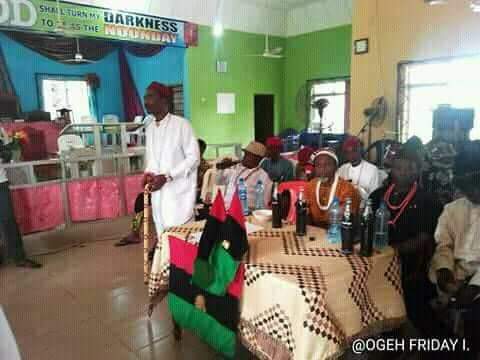 Elder Igwe Omengboji, a member of the elders forum who came from Igweocha advised the entire state executives to work collectively in making sure that all the nooks and crannies of the state is being saturated with the gospel of Biafra restoration. Elder Ebere Agonsi who attended the inauguration from Igweocha also while addressing the people advised that they remain strong and focused in the struggle despite what may come their way, because IPOB have so many enemies who are ready to do anything under the surface of the earth to thwart the realisation of Biafra. Meanwhile, Mazi Vincent Udo from Ikotekpene senatorial district, pledged his total support in all ramifications both in the area of evangelism and finance to see that the struggle moves forward in the state. Pastor Etim U. Udo who is a member of IPOB based in diaspora, but because of the ceremony returned home, expressed his delight over the successful inauguration and pledged his total support in making sure that the state meet up with the expectations in the struggle to restoring Biafra. The Akwa Ibom state IPOB coordinator Mazi Udo, when took the centre stage, appreciated the general house who came for the inauguration especially those that came from outside the state such as Ebonyi, Enugwu, Imo, Abia, Igweocha and from diaspora. He urged Biafrans present and the members of his executives to work hard in their various areas of primary assignment and jurisdictions to see that Biafra is being restored within a shortest period of time. He emphasized on the area of information dissemination as one of the major challenge the state is currently facing and pleaded to the national leadership of IPOB under the command of Mazi Nnamdi Kanu to help and extend the Radio Biafra frequency modulation to the state so that the people will have the privilege of participating in the activities of IPOB and get the direct gospel and information propagated in Radio Biafra as well as Biafra Television and also have the opportunity to making their own contributions during the interactive and audience participatory section on live programs. Kola nuts which signifies unity, peace and progress was presented and was used to pray in all the different tribal languages of Biafra both the Igbo speaking Biafra, Ishekiri, Ijaw and the native language of Akwa Ibom state, to further show that Akwa Ibom and other parts of South- South are part and parcel of Biafra and nothing under the earth will separate them. Bishop Tete Peter of Ikotekpene senatorial district prayed and handed over everything including the state executives into the hand of the almighty Chukwu Okike Abiama through prayers and also prayed for the safe journey of those who attended the inauguration from far and near back to their various destinations.